DETROIT (AP) — Olympia Entertainment President Tom Wilson traveled throughout North America, visiting NHL arenas to take the best ideas from them for the Motor City. He also took a look at how the roof of a hockey arena in Russia during the 2014 Winter Olympics was lit up with cool displays. 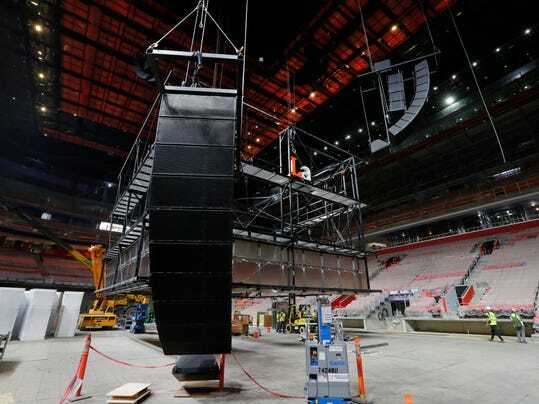 Just three months before Kid Rock becomes the first star to perform in the centerpiece of a 50-block development, Wilson touted the facility that the Detroit Red Wings and Pistons will share next season. The arena is part of an active construction zone in an $800-plus million project. Much of the arena is draped with an aluminum shell that will become a big screen to show projected videos and images to create the same effect people saw three years ago during the Sochi Games.